Denny Jump (Bellevue, WA, United States) on 10 August 2010 in Plant & Nature and Portfolio. 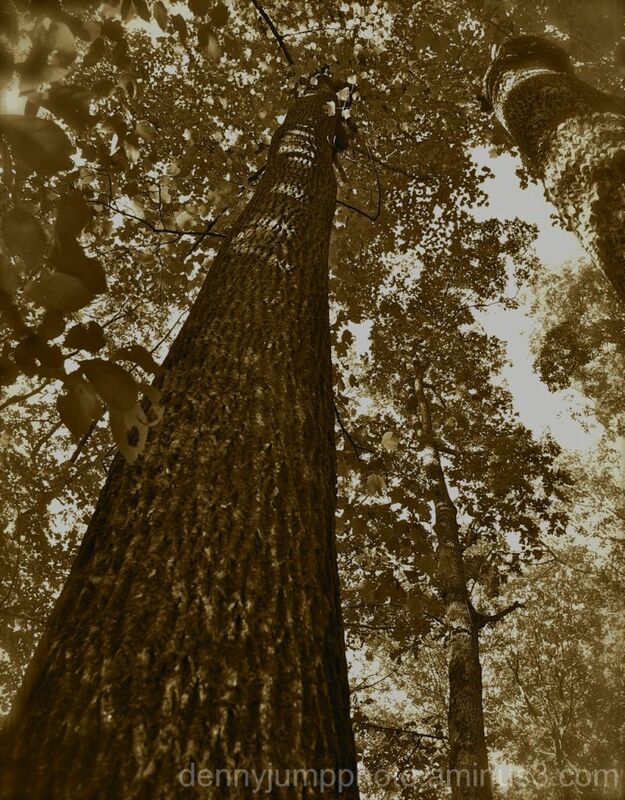 In the woods around Pennsylvania and New Jersey, old growth trees of all kinds seem to be surviving relatively well, despite the ever-growing human population and other mostly "human -caused" challenges. This giant maple (located in the woods at Merrill Crek Reservoir in western New Jersey) was one of the largest I had seen that day. In fact it's one of the largest I believe I have ever seen anywhere! After working on the image at home, I decided to try and duplicate what an original photo of this tree MIGHT look like if it were captured perhaps 100 years ago. Most times I feel as though I have been around that long anyway so why not make it fit! I hope you enjoy. Gorgeous shot in this sepia tone! The view up in this angle is amazing. Really gives you the sense of the scale. I love the soft vignette and the beautiful play of light. @Bettina: Hi Bettinia - Thank you very much for that - I had fun with this one to be sure and I am glad that folks seem to be liking it. I love your post for today! Pure majesty! The perspective is great and the color is even better! @Phil David Alexander Morris: Hi Phil - Thanks very much. I feel as old as the tree today..... BTW did I get your name right today ? As Fats Waller used to say "One never knows, do one?" Have a great day Phil and, as always, I love your image for today as well! @Tamara: Hi Tamara - SThank you very much for your remark - yes the tree looks pretty tall - and it was too :-).....Speaking of POV, see my note on your post - a cool job there Tamara! @Scene by Sharon Photography: Hi Sharon - Congratulations on your 500th Photo and thank you very much for the comment. I had great fuin with this one - very pleased with the "height" aspect that came out pretty neat Thanks again! I like the perspective here, Denny. Interesting sepia toning too. @Julie Brown: Hi Julie and thanks again - I really had fun with the camera and pov on this one and then decided to do the sepia at home. Thank goodness for lcd' so one can review their shot in the field . I am upset about your monument flowers though...are you SURE it will be 20 years minimum before they bloom again ? :-) Thanks Julie ! Love it - super processing Denny. What a tree! I love your perspective- really gives me that feeling of being completely dwarfed by the forest! Beautiful toning, too! @Tracy: Hi Tracy - Thank you very much. It wqs/and is a gorgeous straight and tall Maple - I can't wait to go back and visit these guys in the autumn! We feel so happily tiny under Mother Nature greatness. Superb light under this giant angle. @k@: Hi K@ - Thanks so much - I was enjoying the light as it shined down - unfortunately no beams or shaftys, though...just wasn't that kind of day - Thanks again! An eye-catching perspective of these maple trees with nice detail on the bark of the trees. @Steven: Hi Steven - Thanks very much . I do appreciate it. A very interesting point of view, Denny. It makes me think of a kind of natural cathedral, with the large and tall trunks sustaining the dome... In my modest opinion, the processing of the image is absolutely appropriate, as usual. @oriol: Hi Oriol - Thank you for the very kind comment. This is so relaxing - I'm sitting here trying to work on a script - with the song Lady of the Island - playing by Crosby Nash and Young - when I flipped over to take a look at your photo - and here I sit - looking at it. Great POV and processing Denny. @Calusarus: Hi and thank you very much - I do appreciate it. This remind me of the giant redwood trees (which seem like gods). I had no idea a maple could grow so majestic.....just wonderful. I like this perspective looking right up into the sky and the leaves on the tree! Great shot and a very large Maple as you said! Wonderful POV and treatment. I also thought of the redwoods. Love this view, and I really appreciate your coloring effect. Great shot. I love this image with its vintage feel. That is a wonderful tree. @Steve Rice: Hi Steve and thank you very much. There were several huge trees like this all around...patriarchs for sure. Thank you for your comment - Love your photos you have been posting! That certainly is a huge tree, and so well captured! Love the color processing also, it does fit the shot quite well!